Herbert “Bertie” Sadler made TCI history his life’s work. Herbert “Bertie” Sadler, the Turks & Caicos Islands’ own “History Man,” died in 1992 at his home on Grand Turk. He had spent most of his adult life in the Turks Islands and wouldn’t dream of living anywhere else. He loved the Islands and their people and was happy and in his element here. This seems to have been a reciprocal relationship, as Islanders remember him very fondly. 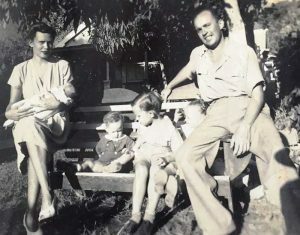 This image shows a young “Bertie” Sadler with his family (from left): Wife Linda with newborn son Denis, and his other children Charley, Frankie and Marjorie. Bertie first came to Grand Turk in the 1950s as a young man from the Jamaican civil service bearing the title of “Assistant Commissioner, Competent Authority.” He wore several hats in service of the Turks & Caicos Islands Government, including setting up and running the Central Purchasing Unit, tasked with sourcing and developing bulk food imports and shipping links at a time when post-war conditions made this difficult in these small islands. Following his retirement from the civil service, he and my Mom settled permanently in Grand Turk and went into the private sector there. What led to Bertie’s work in compiling the history of Turks & Caicos IsIands? I cannot speak definitively as to who or what inspired him to set his course on writing down the history of TCI, but I do have some insights. He once made the cryptic comment that as an under-worked civil servant, he found he needed a hobby, so took to researching and writing up the Islands’ history. This “hobby” became his life-long passion. In retrospect, one can see why it would become so absorbing. The history of these Islands is fascinating, especially as they are rather remote and tiny, yet their history is lively and rich—with so much still to discover! From the period of the Lucayan Indians, to the Columbus Landfall proposition, through the Bermudian adventurers, seafarers, settlers and salt rakers, the shipwrecks and “wracking” industry, the politics of small island governance, the Bahamian and Jamaican influences, and the tug-of-war in the Western Hemisphere between the great powers of France, Britain and Spain—all this and more became his lifelong journey of exploration. My father had an agile and inquisitive intellect and it is not surprising that he would have turned his mind to something other than commerce. He was an avid reader on many subjects, not only history, but also current events, discoveries, other countries, etc. I remember him always with his head in a book or periodical in his leisure time. A well-worn and scruffy overstuffed binder was always in his possession as he went from place to place. I think he used this to record notes and ideas and stuff with collectibles, writings and cutouts, and it may have been a daily planner. Having spent several years in the inner circles of the TCI Government and having first-hand access to data and reports on the Islands, his appetite was whetted and he became interested in learning more about the Islands’ background and the events that influenced and shaped them. He was encouraged in this by several friends both here and abroad. Amongst these were his many Bermudian connections, whom I know contributed a lot to his research and inquiries. He was a member of the Bermuda Historical Society and Maritime Museum, and was frequently in communication and discourse with those members and other private individuals there. The same was true of the Bahamas and its National Archives, which he corresponded with and visited several times. Independently, he devoted a lot of time and resources to collecting and tracking down records that would add to his knowledge. It was a fun but time-consuming pastime, especially considering there was no internet or online resources available to him in those days, and he was reliant on the local mail for material. Bertie had an aptitude and enthusiasm for sleuthing down stories and records relevant to the Islands and over the years collected an impressive array of material from multiple sources—some from archives and museums he would visit himself. In compiling the history, one can see he had a particular penchant for the curious and humorous customs that were at work, especially in Victorian times. For example, the vestry deciding the price of bread; the tolling of the jail bell to announce working hours for the salt workers; the proceeds of the liquor licences going to support the clergy; the rivalries and feuds between members of the citizenry; even the “trouncing” of Horatio Nelson by the French at Grand Turk! Although he had a background as a government careerist, he was fond of caricaturing the ridiculous side of bureaucracy also. His work and research is impressive in its accuracy, depth and far-reaching scope. I have great respect for the voluminous amount of work he put together, and the underlying expansive research that supported it, but it is also enhanced by his love of narrating stories. He relished an audience, and people remember him as a gifted raconteur with an infectious laugh. The storytelling is shown in the style and character of his book, Turks Island Landfall. Not a conventional academic work, it includes collections of historical curiosities, the unusual and different perspectives of the old days, and how things were carried on. Bertie traveled extensively and spared no effort or personal expense in conducting his research in archives and libraries in the UK, Spain, the Bahamas, Bermuda, and several institutions in the U.S. He was indefatigible in probing every resource that could add to his knowledge of the history of the TCI, all the while corresponding with many other scholars and researchers. It was his labor of love. He also enjoyed travel for its own sake, and over the years he and my Mom covered a lot of ground overseas, taking an extended trip every year. He collected written material wherever he went to satisfy his curiosity about other countries. At left is Bertie Sadler’s good friend, John Houseman, publisher of Grand Turk’s Conch News. Some memorable characters passed through my father’s life in the Turks Islands, and many became life-long friends. On many a Sunday afternoon we visited the Hon. Evan and Mae Wood in their home on Middle Street, a pretty, pink two-story Colonial house with a large tamarind tree in the front yard and whitewashed Bermudian walls. The house had a lean-to feeling in the upstairs rooms looking back on Pond Street. Evan Wood was a highly respected senior official in government, then treasurer, I believe. He and my father worked together in the local government and formed a lasting friendship. His wife, Mae, known as “Nurse Wood,” was the matron of the Grand Turk hospital and the island’s midwife. She loved to boast that she had personally delivered most of the Grand Turk population. She and her sister, Minnie Tatem (the Anglican Church organist) also ran the “Todd’s” shop on Front Street, a metal-sided building next to the Kursteiner Building. There they sold sundries—everything from postcards, Bay Rum, toiletries, cakes and candies to household items. While you were shopping you could get your legal documents notarized by Nurse Wood, who was also the Justice of the Peace! 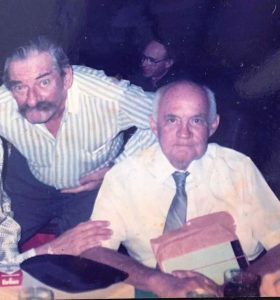 Arthur Tatem, who may have succeeded Evan Wood as treasurer, was another close friend and colleague who I remember well. Burly, humorous and chatty, he and Bertie exchanged countless sagas of Turks Islands life and gossip. Always around was the irrepressible John Houseman, an unforgettable and lovable character. John was a very erudite, humorous and charming Colonial transplant to Grand Turk after his stint with the British MI-5 in Greece during World War II. In short order he became a beloved “Islander,” not the least due to his unabashed and public criticism of the British hierarchy and the pie-in-the-sky projects they were promising to produce for our benefit. He and my father enjoyed hours together satirizing the latest British efforts at “dewelopment” for the Islands: the endless stream of consulting teams, followed by the inevitable and costly reports that just gathered dust on a shelf back in London without ever producing anything. This was back in the 1960s and 1970s when the salt industry was finished, sisal production done, the fishing industry meager, and nothing on the horizon to jump-start the Caicos Islands. John started and ran the Conch News, our local rag, which he strove to put out every two weeks or so when he could manage (it wasn’t always timely). He also ran the Turks Head Inn for a time and before that tried living on East Caicos with only donkeys and mosquitoes for company. A fellow advocate of the Columbus First Landfall in Grand Turk theory was Josiah (“Cy”) Marvel, an uprooted New Yorker who moved to the Islands in search of utopia and found Christopher Columbus on Grand Turk. Their only point of difference was exactly where Columbus first landed, Hawkes Nest or Pillory Beach (Cy opts for the latter and has pursued quite a bit of research on the subject). My father swore by Hawkes Nest. Who knows? Enough to say, they became good chums, exchanged much information and had endless discussions and arguments on that and other subjects. But writing Turks Islands’ history does not itself produce a livelihood—or didn’t. Another side of Bertie Sadler was the local businessman and merchant. In the early 1960s, he packed in his Jamaica government career and moved back to Grand Turk to become a capitalist. I think he had acquired a wealth of knowledge in the food business by having started and run the TI Central Purchasing Unit for importing basic supplies into the Islands for inter-island distribution to local shopkeepers. In fact, I have to say his knowledge of commodities and food sourcing was second to none. He could tell you which suppliers or country produced the best canned butter, milk, corned beef, jams, biscuits and so on. He studied and knew them all, and dealt directly with several in his import business. In a private capacity he started what was called “The Shopping Centre,” aimed at bulk buying of basics and food staples and wholesaling to local merchants. The operation became important in fulfilling local needs, and in those days all the Turks Islands and out-island merchants would gather at Grand Turk to purchase commodities for their retail stores. Some notable customers I can remember were: Ashton Simons, Leon and Irene Godet, and Jack and Alice Crisson from Grand Turk; the Misicks, Claudius Williams (a favorite customer), and Lou Handfield from Bottle Creek, North Caicos; the Hon. Emily Saunders of South Caicos; Howard Hamilton of Provo, and many others. Out-island shopping visits to Grand Turk saw truckloads of rice, sugar, flour, canned milk, corned beef, cooking oil and the like going out the shop door headed to the dock, to be shipped and re-sold throughout the TCI. This was the commercial domain of Bertie, aided by his right-hand man John (“Biscuit”) Williams—the able foreman of everything, Nurse Wood writing up the books and receipts, Fanny Durham handling the cash, “Igno” the sub-lieutenant and shelf stocker, and “Puss” the shop cat. There was also a constant stream of visitors and pilgrims from overseas journals wanting to tap into the past and present of the Turks Islands and have a chat with Bertie, the “Island Historian,” a status he thoroughly enjoyed! Yet all that wasn’t enough and Bertie turned to another hobby. Observing that there was nothing much to do on Grand Turk at night, he bought a couple of movie projectors, imported films from Miami, set up a movie theater above the shop, and started Grand Turk’s first (or almost first) movie theater! It was a great treat for everyone, especially the “jumpers”—kids who would jump the newly built high wall to avoid paying for entry. The audience loved it, even waiting the five or ten minutes while Daddy changed movie reels. Bertie was also active in other organisations, notably the Columbus Landfall Committee, the Quincentenary Committee, and was chairman of the TI branch of the Caribbean Development Bank for a time. Although raised a Catholic, he was not much of a churchgoer, yet tried his best to make us, his kids, get religion! His achievements earned him an Order of Merit medal in 1988 from the government for his public contributions and work in bringing positive attention to the Islands’ history. He appreciated the recognition. 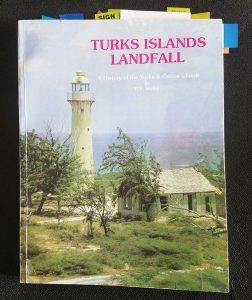 Above is Marjorie Sadler’s well-worn copy of the 1997 edition of Turks Island Landfall. She is working on a reprint that should be available within a year. He leaves behind—in me at least—a similar passion for the history of Turks & Caicos and finding out more. This led me, after his death, to re-visit the Turks Island Landfall volumes he had produced and re-publish his works under cover of one consolidated volume from the Columbus period up to the mid-1980s. This came out in 1997 and, unfortunately, is now out of print. The good news is that I’m currently working on producing a reprint, which should be available in another 12 months or less. Hopefully, I’ll be able to integrate some graphic and other improvements to the publication without altering the style of my father’s work. My sense is that it’s something that should not be “put away” or forgotten but will be welcomed by many people here and abroad.